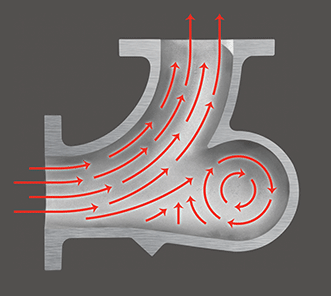 Unlike conventional "impact" elbows and "plugged-tee" elbows that rely on material impact to change direction, HammerTek's Smart Elbow® design employs a spherical chamber that protrudes partially beyond the desired 90° or 45° pathway, causing a ball of material suspended in air to rotate. Since the ball of material rotates in the same direction as the airstream that powers it, incoming material is cushioned by the ball's rotation, and is gently deflected around the bend. By preventing impact with the elbow wall, HammerTek's Smart Elbow® deflection elbow virtually eliminates costly elbow wear, material degradation, melting and plugging.